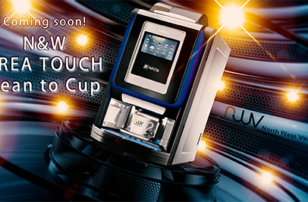 Exclusive to the UK – from North West Vending Ltd.
We are delighted to announce the introduction of the “ION Water Cooler” to our product range. Only the ION gives you freshly filtered water from a sealed water pathway, from the filter to the faucet, no air contact with the water. 10 times greater cooling capacity than any other cooler. Winner of an international design competition, the ION is much more than a pretty face. Using state-of-the-art technology, the ION combines Form and Function to redefine the old-fashioned, bottled water cooler. Every glass is freshly filtered and instantly chilled. There are thousands of ION’s around the world and millions of people have used this unique product. “What you don’t see in the ION is really the most important part. First, a proprietary and uniquely-designed water pathway that is sealed and pressurised so air cannot touch your drinking water. Your drinking water is not stagnant in a bottle or tank, with the ION, you can be sure that every glass is freshly filtered and instantly chilled. The ION’s high-capacity cooling system is called InstaChill, which means there’s no more waiting for a cold glass of water on a hot summer’s day. With the ION, you have around 10 times greater cooling capacity than any other cooler. “in 1 hour, an ordinary cooler produces about 12 x 8 ounce cups of 50 degree water … and 50 degrees isn’t very cold. 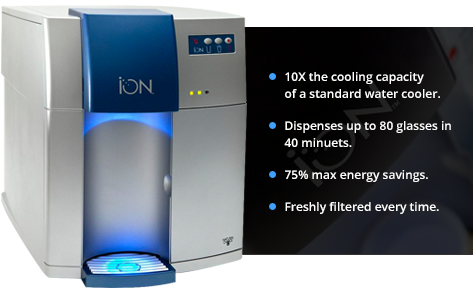 In less time, about 40 minutes, the ION kicks out 80 x 8 ounce cups and at a refreshing 42 degrees or colder. There is no comparison to anything else available on the market that has this high level of cooling capacity. “If you’re trying to reduce your carbon footprint, then there’s no other product like the ION. Sure you get an endless water supply, no bottles, no deliveries, no dock or security issues. But you’ll also be glad to know that ION has a built-in energy-saving feature called SleepMode. A photo sensor detects a dark room, so that when the lights are out on evenings and weekends, the ION automatically turns off the compressor and drops the hot water temperature. This saves 30% in annual energy usage which is not much for one cooler in a building, but in some installations, it does become a big deal, where 20, 30 or more coolers are involved.